Support the restaurants that support fair wages; have a chance to win a free meal! You probably already know that hundreds of Maine small business owners publicly support this year’s referendum to raise Maine’s minimum wage to $12 by 2020 and to gradually increase wages for tipped workers as well. Now is the time to stand with the businesses that share our values. The best thing you can do for these restaurant owners is to eat at their restaurants. So we’re going to make it extra easy and fun to do so this week. From Monday, June 13 to Sunday, June 19 eat out at as many of the below restaurants that support Mainers for Fair Wages as possible. 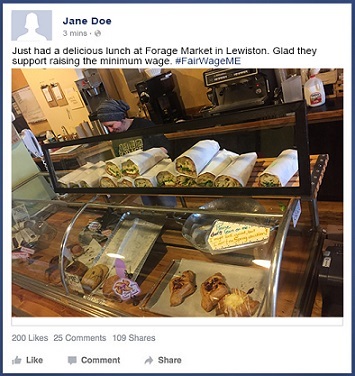 Every time you do, take a picture of your meal or yourself at the business and either email it to mainersforfairwages@gmail.com or post it on social media (Facebook, Twitter, or Instagram) and include the hashtag #FairWageME. For every photo you submit (only one per meal please! ), you will be entered into a random drawing for a $50 gift card from a supportive restaurant in your area. We’ll also post some of our favorite photos on MSBC’s Facebook and Twitter pages. The more your support these restaurants, the better your chances of winning and the more we will encourage other restaurant owners to join this campaign. We might even encourage a few more restaurant owners to join us. The winner will be announced the week of June 20 on www.mainesmallbusiness.org and by email.